The U.S. government formally notified Congress on Oct. 20 of a $60 billion arms sale to Saudi Arabia. The package, which includes both combat aircraft and military helicopters, is considerable and will provide the Saudis with even more of some of the most modern fighter jets in the entire region. Militarily, however, Riyadh’s challenge is not a matter of hardware: Saudi Arabia already fields a broad spectrum of some of the highest-end and most modern military equipment in the region. Instead, its challenge is fielding that hardware. With deliveries years away, the new deal will do little to balance the resurgent Iranian regime in the near-term, and prolongs Saudi Arabia’s heavy dependence on U.S. defense support. 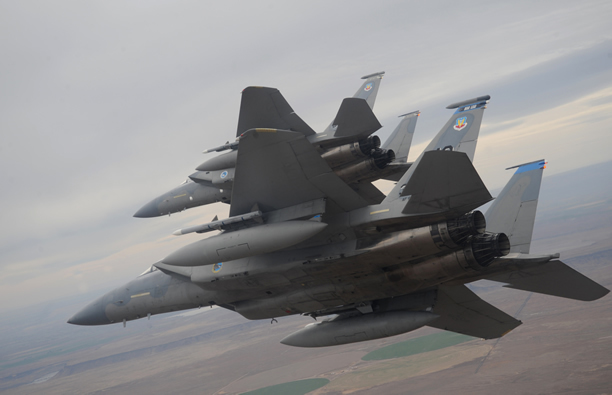 84 new-build and more modern variants of the F-15S combat fighter aircraft. The upgrade of 70 existing Saudi F-15S to this new standard. 70 AH-64 Apache attack helicopters. 72 UH-60 Black Hawk utility helicopters. 36 AH-6i light attack-reconnaissance helicopters. Associated armaments, including air-to-air and air-to-ground ordnance (including 1,000 “bunker-buster” bombs designed to penetrate hardened and deeply buried facilities). Now an Idaho news source, Mountain Home News reports that the United States will be facilitating a training base for the Royal Saudi Air Force in Mountain Home, Idaho. The Idaho congressional delegation received notification Friday that Mountain Home Air Force Base has been chosen as the preferred site to host a training mission for the Royal Saudi Air Force. Placing a training base in the United States is part of a $60 billion arms package the Kingdom of Saudi Arabia is purchasing from the U.S., which includes 84 new F-15SA fighter jets and upgrades to the Saudi's current inventory of F-15C fighters. Col. Pete Lee, vice commander of the 366th Fighter Wing at Mountain Home Air Force Base described the announcement as "a great opportunity," for the base, the local community and the region. The Saudi government will apparently bear all costs for basing the squadron.The arms sale will doubtless be welcomed by the arms industry in the United States. As however Saudi Arabia is a known sponsor of Wahabbist terrorism, is this arrangement really in the best long term interests of the U.S? I was in the Air Force for many years and have seen many foriegn fighter pilots in training at AF bases. This is not a big deal. The biggest reason is these foriegn pilots literally never rise to the skill level of a average American pilot. I'm not sayng this out of bias or love of country it is simply true. Some of the foriegn pilots certainly achieve capabilty to fly the planes but for some reason they never achieve superiority. I don't know why, cultural, lack of support by their own government, lack of follow on training, whatever. But the bottom line is if we (the U.S.) ever has to face any of these pilots in actual combat then those foriegn pilots will die. This isn't true for Israeli pilots, some British pilots or Russian pilots but for all other contries the fighter pilots never rise to a competence level that is competitive. On the surface, it does not appear to be a critical issue. HOwever, it does open the door to additional spying on the United States with connections to the radical Islamist terror network. The Saudis who piloted the 4 airliners on 9-11 managed to hit 3 of their 4 intended targets. Islamics lie. Their "religion" demands it to hide their true intent from "infidels" = US. Does Ft. Hood ring a bell? So who really knows where their loyalties lie with any degree of certainty? Only thing, what if just one Saudi pilot takes off on a training mission fully loaded with weapons and discovers his "call" to Allah and decides to take out a US city? Your picture is NOT of Mountain Home AFB, which is not located on the ocean. (Idaho is landlocked) nor is it nearly that green. Let's see...a Russian Naval Air base in Tennessee now the Saudis on Idaho....what other nations bent on our destruction are we building bases for here? So, the very place where the terrorist of 9/11 came from will now be flying billion dollar aircraft loaded down with some of the most sophisticated weapons in the world in the US. Anyone see something very wrong here? All you need is just one of those pilots to go on his personal jihad and drop a few 500 lb bombs in the middle of some shopping mall in Idaho. Seriously bad idea if you ask me. This seems totally insane to allow the terrorist country training and access to arms within OUR BORDERS. Haven;t they attacked us several times already? It looks as if the POTUS is REALLY trying to wipe us off the map! Will we make them stay on the base and forbid them to have services like our people on their territory? Oh, and how about the Russian control of 50% of our uranium? Oh, and the START TREATY?????? And. . . . the list goes on and on and ON. The headline is misleading. We train foreign personnel all the time.